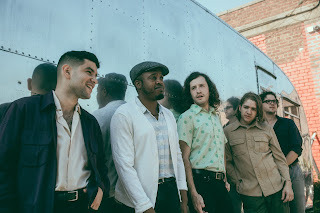 If It's Too Loud...: Durand Jones & The Indications featuring Aaron Frazer - "Don't You Know"
Durand Jones & The Indications featuring Aaron Frazer - "Don't You Know"
We're quietly in the middle of a soul revival, and no one is doing it quite like Durand Jones & The Indications. Their latest single, "Don't You Know," features Aaron Frazer on vocals and sounds like it's straight from the 60's or 70's. Seriously. If the press release that came with this declared it was from a lost Motown session we'd all believe it. It's an impossibly smooth classic soul song, the kind we all need to hear every so often regardless of what style of music we prefer. As much as we loved their debut album, this new song feels like a step forward even though it's a throwback to half a century ago. You can watch the video for "Don't You Know" below. American Love Call, the new album from Durand Jones & The Indications, will be out March 1 on Dead Oceans/Colemine Records. You can pre-order the album here. For more on Durand Jones & The Indications, check out their website. Their upcoming tour dates are below the video.